Astronomers Find Bizarre 'Lawn Sprinkler' Asteroid : The Two-Way P/2013 P5, with six comet-like jets, was first spotted using the Pan-STARRS 1 telescope in Hawaii, and then seen in more detail by the Hubble Space Telescope. 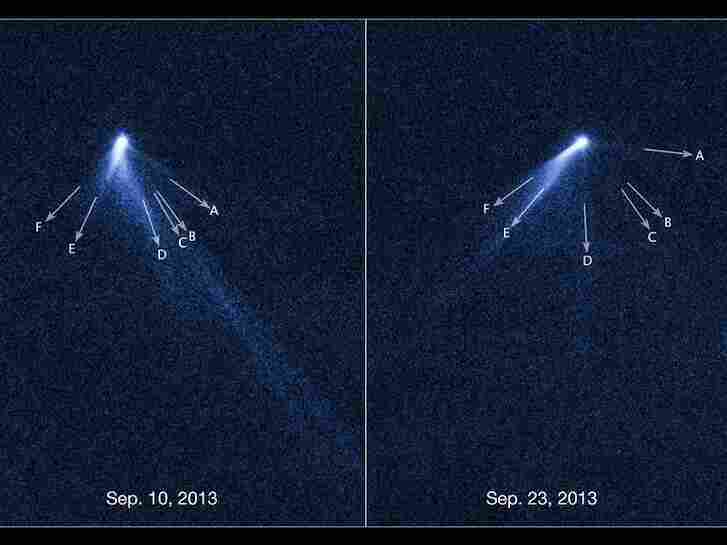 These NASA/ESA Hubble Space Telescope images reveal a never-before-seen set of six comet-like tails radiating from a body in the asteroid belt designated P/2013 P5. Astronomers using both ground- and space-based telescopes have discovered a new kind of asteroid that sports not one, but six comet-like tails, and has been described as looking something like a rotating lawn sprinkler. P/2013 P5 was first spotted with the Pan-STARRS 1 telescope at the top of Haleakala volcano in Maui, Hawaii, in August and then followed up with more detailed observations using the Hubble Space Telescope. The object is located in the Asteroid Belt, a region of the solar system between the orbits of Mars and Jupiter, where space rocks reside in abundance. Most of them are pretty ordinary, but with P/2013 P5, "We were literally dumbfounded when we saw it," says lead investigator David Jewitt of the University of California, Los Angeles. "Even more amazing, tail structures change dramatically in just 13 days as it belches out dust," Jewitt says. "That also caught us by surprise. It's hard to believe we're looking at an asteroid." According to the study abstract in The Astrophysical Journal Letters, Jewitt and his fellow authors believe the object "appears inconsistent with an impact origin" but may instead be "losing mass through a rotational instability." " 'In astronomy, where you find one, you eventually find a whole bunch more,' Jewitt said in a statement. 'This is just an amazing object to us, and almost certainly the first of many more to come.' "